PSA: It is officially autumn! Okay.. I know I'm late to the party but better late than never. Anyway, as the past few weeks have been getting colder, heatings been turned on and my summer wardrobe switched over - I am finally settled with the new season. I really like the autumn time, the weather is just perfect and it is probably one of the prettiest seasons. 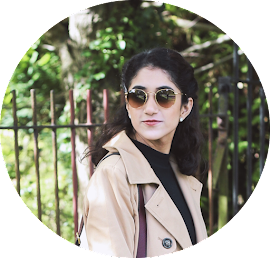 I thought I'd share one of my go-to autumnal weekend looks - whether it is for shopping, brunching or a day trip! I find this outfit to be practical, seasonal and trend-led too. So one of the first things I pulled out for the colder season was my trench coat. It isn't a super thick or warming coat yet isn't so lightweight that it just flies around in the wind. I also appreciate how a trench coat is a classic staple and capsule item in my autumn and winter wardrobe so it's one of those pieces that goes with many things, if not everything! Trench coats don't just come in a typical beige colour nowadays. There are plenty of colour variations now so you can definitely find one that suits you, your style and your personality. I've even styled a trench coat for the summer (a British summer, that is) so there's a trench for every season. Next up, these jeans. I recently popped into Primark after ages and surprisingly did not go super crazy but I did get my heart set on these jeans. In a light blue denim and mom jean style, they are super comfortable and wearable. I usually associate light coloured denim with the spring and summer months but bringing it into my autumn wardrobe has surprisingly been easy as it breaks up the darker and neutral tones. I also like to wear these jeans with a top tucked in (like this outfit) or even with a shirt or a jumper untucked for a more Rachel from Friends vibe. I find that the fit is surprisingly good for a Primark pair of jeans, due to the 'new sizing' I had to pick up a size 4 - usually I am a 6-8. This thin black knitted jumper is one of my favourites for the colder months. I like the frill details on the top as it gives, what would otherwise be a plain black jumper, a bit of an umph. The jumper is an old piece from Mango but there are plenty of frilly jumpers on the highstreet nowadays. My heeled ankle boots have been in my wardrobe for yonks now and I always reach for them, whatever the season. Black boots are a staple piece, a capsule item and must-have in any wardrobe, in my opinion. This beautiful burgundy maroon bag is by Marc Jacobs and it was a honeymoon treat from my husband. I fell in love with the colour of this bag because although it is not black, it seems to go with a lot of my clothes. I also think it is the epitome of this season and matches so well with the autumn colour palette. The style is what drew me to it too, I like how it is a saddle bag style and not too big or too small.